Employing state-of-the-art technologies in a compact device, Raritan's MasterConsole Digital KVM switches (MCD) and 17" LED console drawers with integrated KVM switches (MCD-LED) provides reliability, ease of use, and convenience that you need in your data center, lab or server room. MasterConsole Digital is the next generation of CAT-5 KVM switches for small to midsized (SMB) IT environments. Building upon Raritan's history of success with KVM switches, it is ideal for performing system maintenance, administration, and troubleshooting. Master Console Digital supports the latest digital video interfaces and analog video, along with stereo audio. 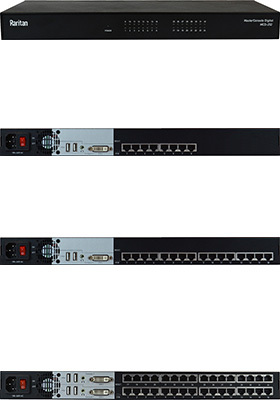 A single switch can connect to 8, 16, or 32 servers and can be cascaded 2 levels to support up to 1024 connections at distances up to 150 feet (45 meters). 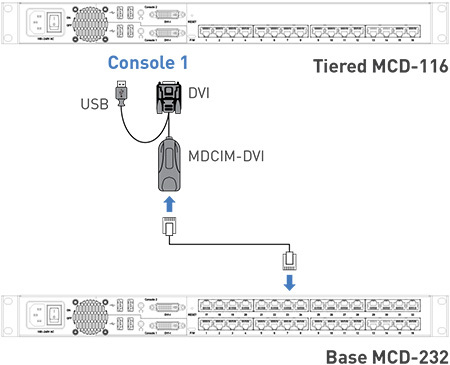 Raritan's MasterConsole Digital KVM switch (MCD) is ideal for small to midsized businesses (SMB) who need to have a centralized point of access to multiple servers without the expense and clutter of a dedicated keyboard, mouse, and monitor for each computer or server. MCD supports the highest HD video resolution of up to 1920x1080 via standard Category 5/6 cabling. The multi-format video interface supports both analog (VGA) and digital (DVI, HDMI and DisplayPort) video inputs, with DVI-I output for the user console, that can support both analog and digital monitors. Stereo audio is also supported by using VGA combo cables or MCD's HDMI dongles. MasterConsole® Digital KVM is available as a single-user switch and a dual-user switch to control multiple servers. It features KVM ports for 8, 16, or 32 servers and can be cascaded 2 levels to support up to 1024 connections at distances up to 150 feet (45 meters). Connecting to a computer is made easier with the use of standard Category 5/6 cables. MCD also provides a friendly OSD (On-Screen Display) interface and hotkeys for quick and easy access connected computers. MasterConsole Digital series is also available as a space-saving 17" console drawer with an integrated KVM switch (MCD-LED) for convenient KVM access at-the-rack. Using standard Category 5/6 unshielded twisted-pair (UTP) cables, MasterConsole Digital series can be cascaded two levels to access up to 1024 computers.